A win is a win, no matter how you get it. 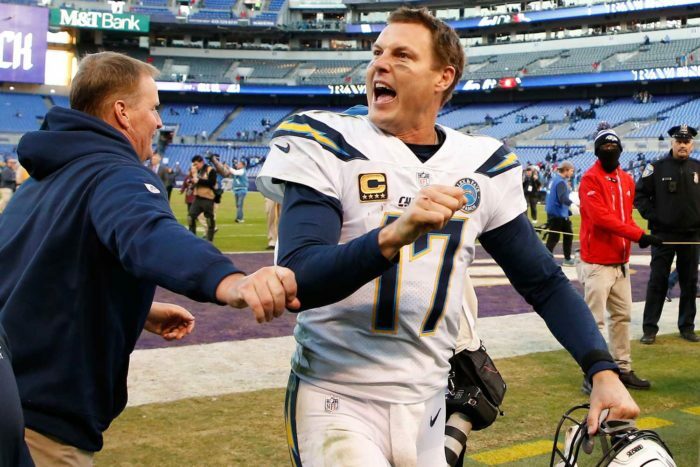 So after a sloppy win against the Ravens in Baltimore, the Los Angeles Chargers have advanced to play the New England Patriots in a divisional round matchup next Sunday in New England. The Chargers’ 23-17 win was not a pretty contest. Notwithstanding that, to go cross-country and play an early-morning game on Pacific time against a physical opponent, any kind of victory is impressive. As fans, we should have seen this kind of game coming, because these two teams played a similar game during the regular season. The Ravens put the ball on the ground three times early in the game, losing one fumble, and quarterback Lamar Jackson chipped in an interception as well. Even with all this good fortune, the Chargers repeatedly failed to seize control of the game. It’s not because the Chargers don’t have weapons. But clearly, the Chargers offense does not match up well with the Ravens defense. The Chargers struggled to move the ball all day but relied on four field goals by kicker Michael Badgley to take an early 12-0 lead, a lead that they would never relinquish. Ravens quarterback Jackson had a difficult time the entire game, but came alive late in the fourth quarter. Trailing 23-3, he nearly brought the Ravens all the way back, and had to make Chargers head coach Anthony Lynn sweat things until the end. Entering the fourth quarter, the Ravens had minus-2 yards passing and threatened to be the first team in NFL history to end a game with negative yards passing. If the Ravens intend to enter the 2019 season with Jackson as their quarterback, they clearly have to continue to refine him as a passer. We anticipate the Chargers will perform much better at New England next Sunday. They have the weapons to keep the Patriots guessing on defense, and their defense matches up favorably with New England’s skill players. The biggest concern will be another cross-country trip, as well as an early Pacific time kickoff for the game. Both teams will have a lot of work to do this week in preparation as they did not play each other during the regular season. Finally, with the Indianapolis Colts at Kansas City Chiefs game being played on Saturday, and if the Colts should win that game, both the Chargers and Patriots will know the victor will host the AFC Championship Game.